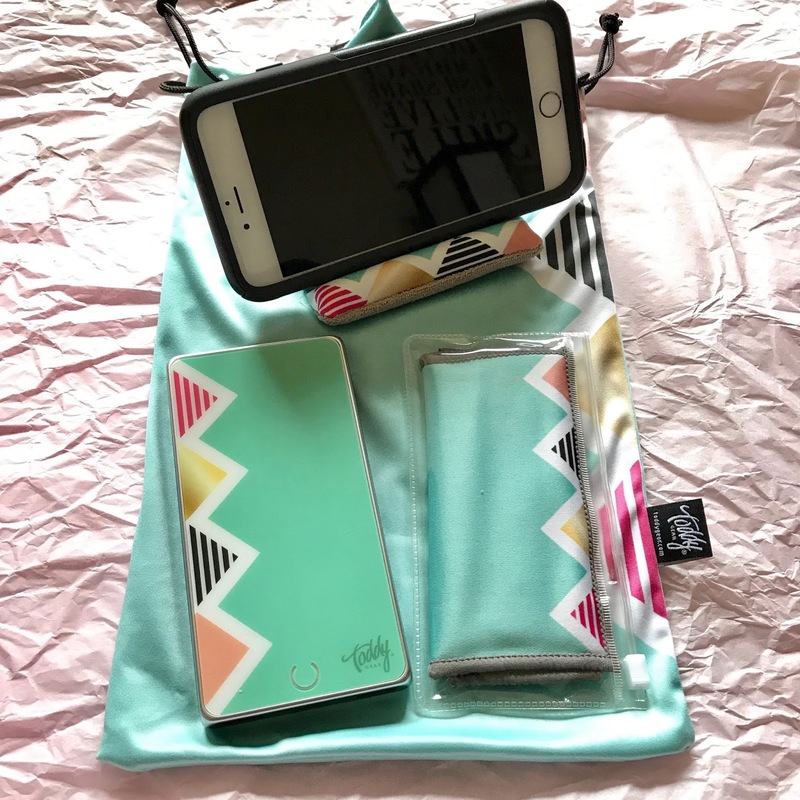 Toddy Gear: Fashionable Accessories For The Tech Geek Mom! Toddy Gear sent me a gift set for my iPhone; Sanibel Desktop Kit, Featuring a Microfiber Smart Cloth, a Wedge mobile stand, and a Smart Charge Deluxe Power Bank. 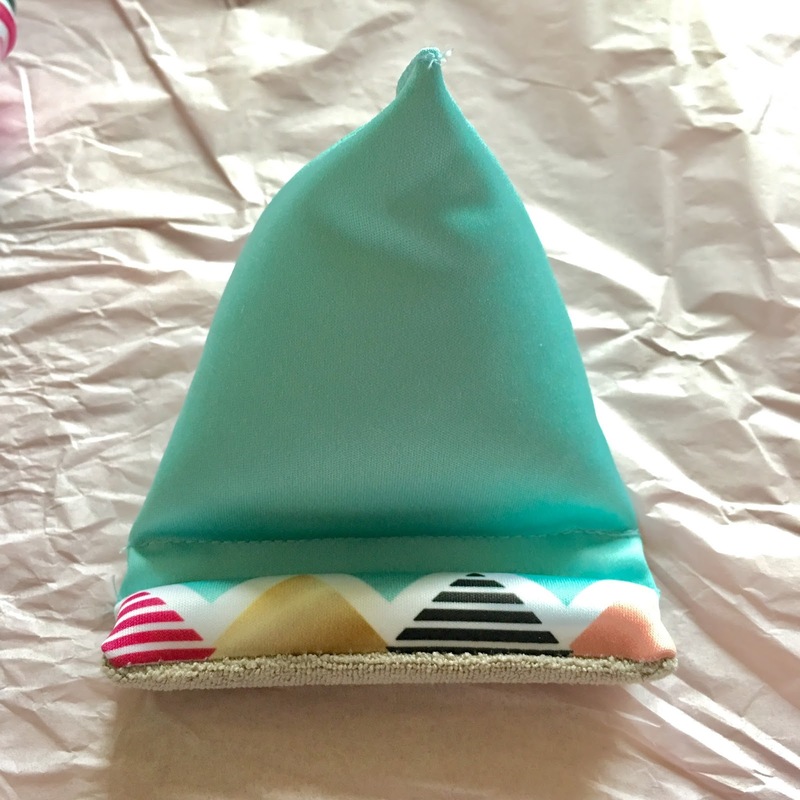 Wedge mobile stand: Made from microfiber material, this wedge is like a bean bag chair for your device plus, it doubles as a cleaning and polishing cloth without using any special sprays to clean your device. It has a special coating to prevent any build up of mold, mildew or odors. It is washable, just let it air dry. Microfiber Smart Cloth: Made from the same microfiber material as the wedge stand, these cloths not only help you take care of your device but also save you from using any harsh cleaning sprays that could damage the screen or body of your device. One side is microfiber for cleaning and the other silky for shining! It's washable, just let it air dry! Smart Charge Deluxe Power Bank: Extra power on the go for almost any device! Features include: 7000mAh battery, Dual USB ports, ideal for charging two devices at once, slim design and sleek interface with LED power indicator light. It's compatible with smartphones, tablets, and wearables that support charging via 5V/1A and 5V/2.1A USB interface. I like that its universal; it doesn't come with a power adapter but it comes with a micro-USB cord. If you have an iPhone or other devices you can just use your own cord and block. Portable and powerful, an external power supply is always a must-have for tech geek moms like me! 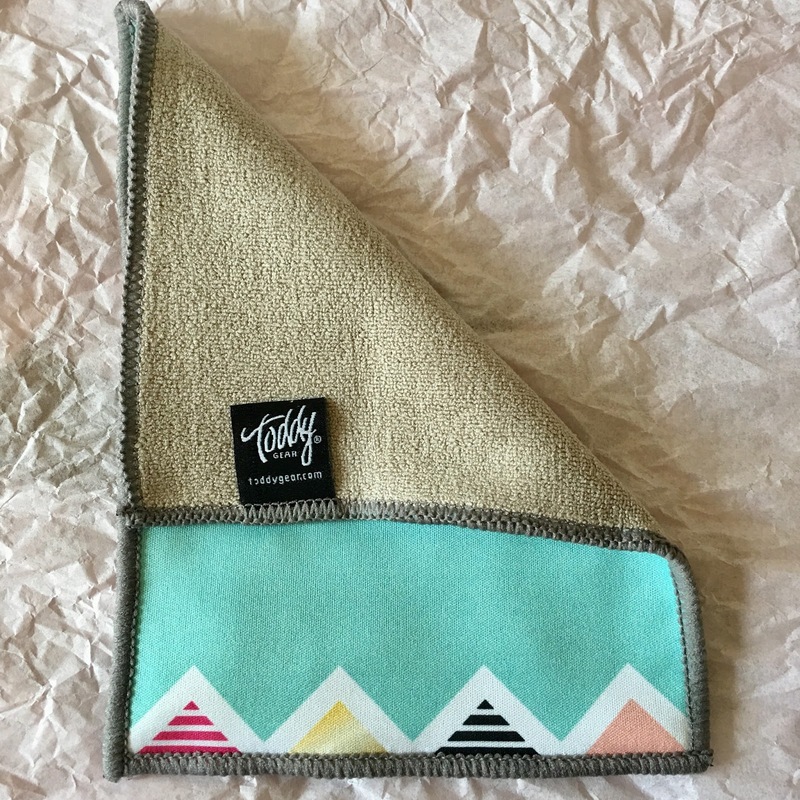 You can find items of this specific deign (Sanibel) each sold separate online but Toddy Gear does offer a variety of gift sets in other designs which are just as nice! Visit www.toddygear.com and use my special code MOTHERHOOD10 at checkout for 10% off your purchase! 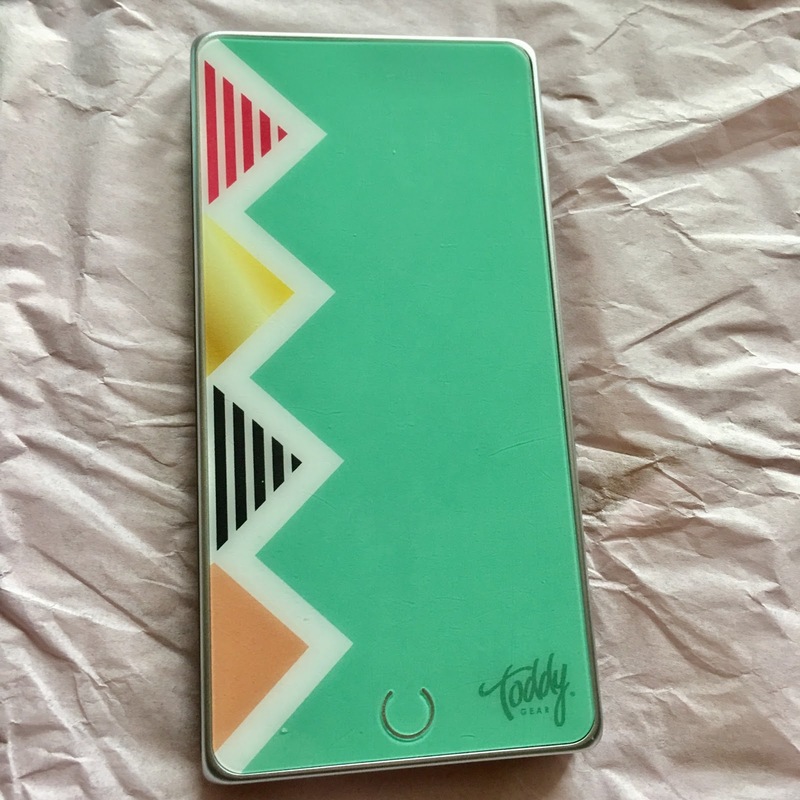 We wouldn't ever want to see you go without power; Toddy Gear has generously offered a Smart Charge Deluxe Power Bank (winners choice style!) up for grabs to one lucky AME reader! Follow the instructions and enter using the ballot below! Open to Canadian residents 18+ excluding Quebec. Mandatory entry must be done for extras to count. Ends April 30. For full AME giveaway disclosure click here. Posted on behalf of Toddy Gear. Complimentary product received for review purposes. The voice of this blog is my own. Giveaway prize provided by Toddy Gear. I love cats, so I would choose the Meow Smart Charge Power bank. Plus I know it won't get taken by any one in my household. :) Thanks for the chance! I would choose the Illusionist Smart charge. I would choose the DEEP WOODS SMART CHARGE DELUXE for my teen son. I know he would like that print. Thanks! I may just have to choose the Slothing Around one! I would choose the Deep Woods because my husband would use it. I would choose the ANCHORS AWEIGH SMART CHARGE DELUXE because it would go with my computer bag really well! I am drawn to the Anchors Aweigh design because I love nautical things, but I also love the Meow Smart Charge Deluxe and that is the one I would choose because I would use this most when I am travelling, and it would remind me of my kitty back at home. I would choose the SANIBEL SMART CHARGE DELUXE because I love the color and pattern. I would chose the DEEP WOODS SMART CHARGE DELUXE for my husband. I like Deep Woods - I could use it and so could my husband. My choice is Straight shooter. Thanks for the chance. I would choose the cottontail collection as I love the print! I'd choose Meow Smart because I'm a cat lady! I really like Starry Night because its a beautiful famous image that always draws my eye!! I would choose the A Sunday on La Grande Jatte. It's a favourite painting. I'd choose the SUCCESS! SMART CHARGE for my partner. I would like to have the MY HEART POCKET TODDY, it's so cute and stylish. I like the cottontale wedge. I like Slothing around because I love sloths. I would choose the Daisy one since it is so cheery. I'm loving the lime chevron style! I would choose ROSES SMART CHARGE DELUXE, because I think its elegant, cute, and girlie but not too out there. I like the DEEP WOODS SMART CHARGE DELUXE. Because it's a really nice classy looking charger, and not too girly.